Have you seen Oz the Great and Powerful yet? My family and I sat down to watch it last week and absolutely loved it. I thought I had such a great message about overcoming obstacles and believing in yourself. Any time I watch a movie I’m always inspired by the costumes. I adore seeing the way the costume designer in the movie puts together fabrics and colors to create the look and mood of the movie. In Oz I fell in love with the character of the China Doll. She’s adorable and spunky. Her costume is equally adorable. 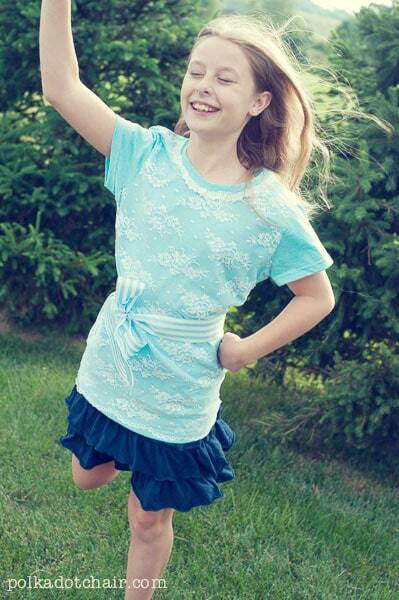 A cute blue dress with a lace overlay and a blue striped belt. 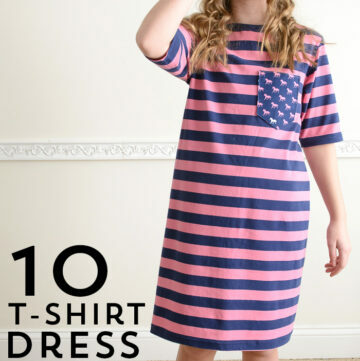 I decided that I would try to recreate the look of the dress but in a t-shirt for my daughter! 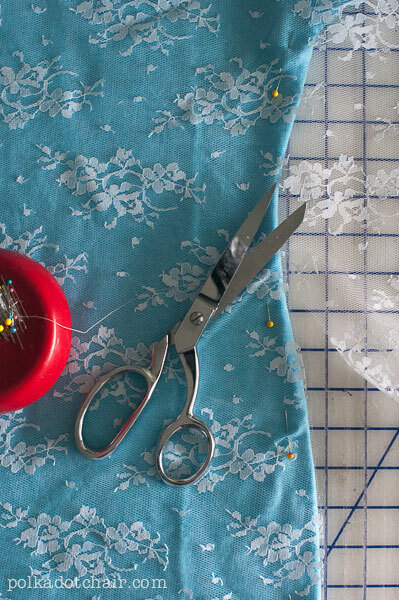 To begin, lay your lace over your t shirt and pin. 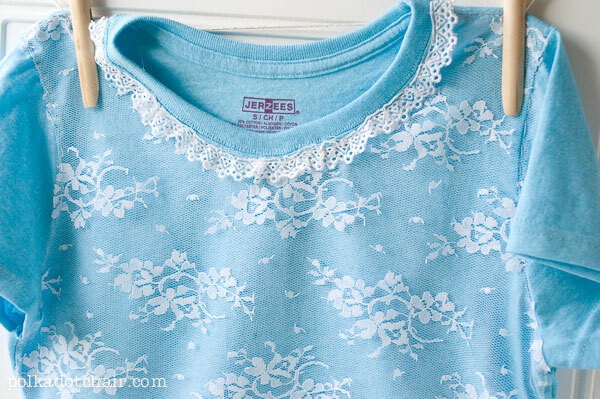 Make sure that the bottom finished edge of the lace is even with the bottom of your t-shirt. 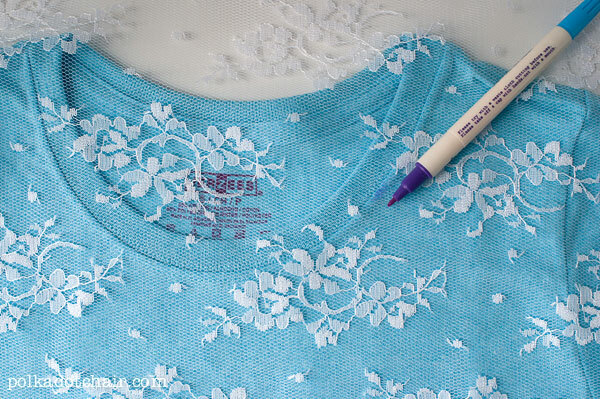 Use a fabric marking pen to mark the collar and sleeve seams on the lace. 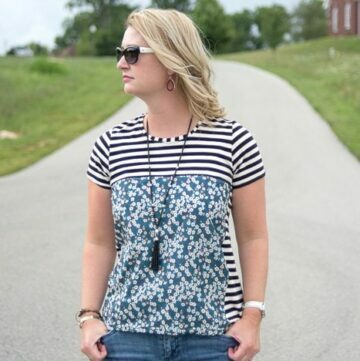 With the lace pinned very well on the t-shirt trim the lace even with the sides of the t-shirt, the sleeve seams and the collar. You’ll need sharp scissors, go slow. Machine stitch up the side seams of the t-shirt catching the lace as you go. 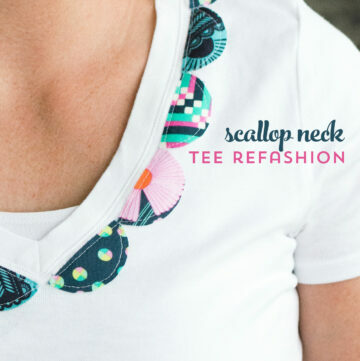 Hide your stitching line in the t-shirt side seam. You’ll need to hand stitch the sleeve seams and the collar. 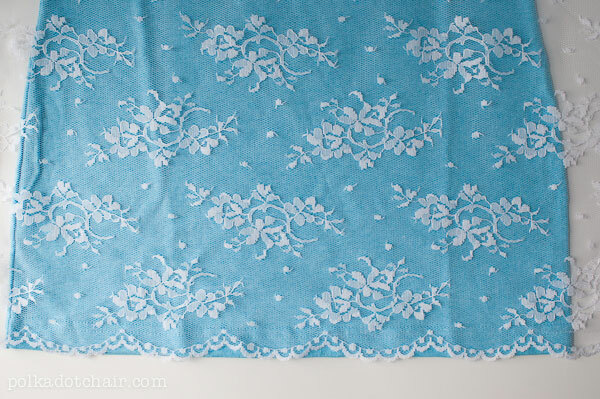 Just do this with a simple running seam (trim off any extra lace when done). 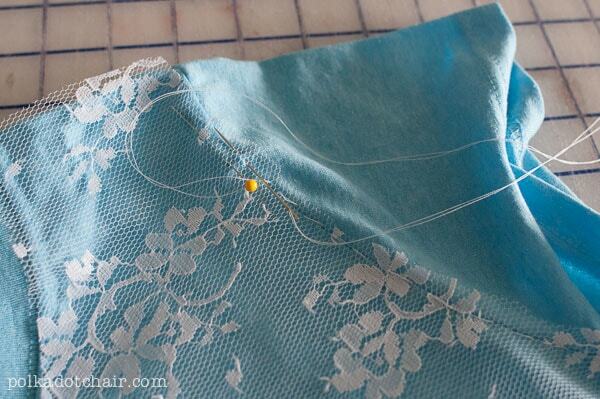 If your lace trim is not already gathered, gather it (that way it will go around the curve of the collar smoothly). 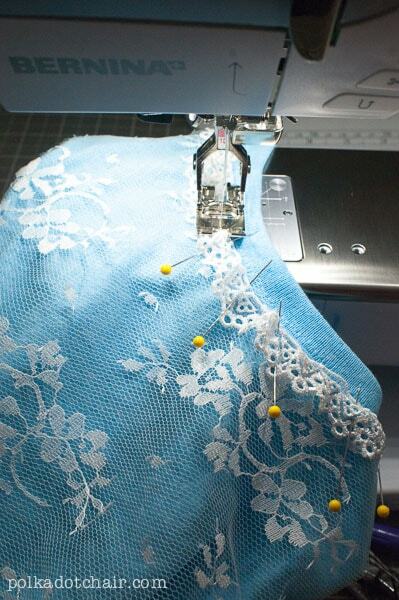 Machine stitch the lace to the collar. This will hide your hand stitching lines around the collar. 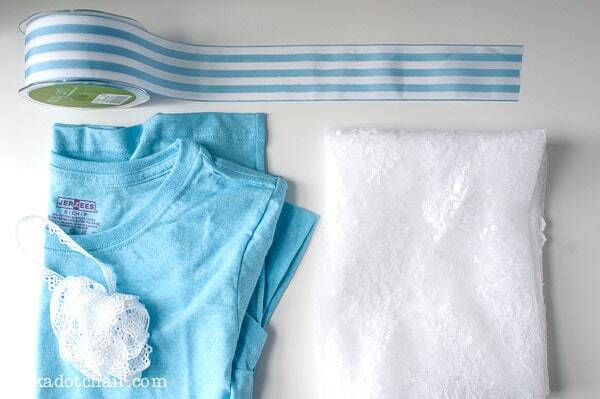 For one last touch, tie the ribbon around the t-shirt to use as a belt. You’re done! Now you’ve got a lace trimmed t-shirt just like the China Doll in the Movie! Ready to go and kill the Witch??? Oz is available now on Blue Ray. We really did love the movie. *Disclosure: This is a paid post through Blueprint Social. All opinions are 100% mine. Beautiful T-Shirt. I have the exact same Tea Pot in my cupboard. I purchased it England 25 years ago. I got mine in England too! I’ve never seen one like it since then. Lovely T, where did you get your lace? it loooks so pretty, Thanks for sharing your tutorial! I got the lace at JoAnn’s. This is so pretty! 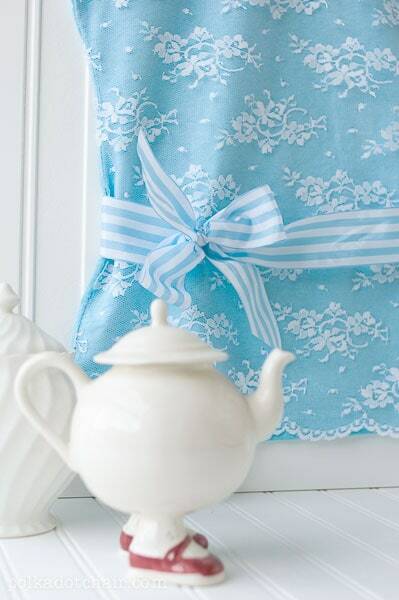 I love the ribbon and trim details. 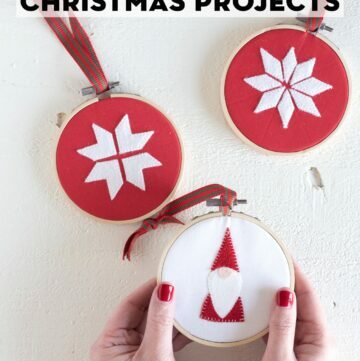 What a gorgeous project! Thanks for sharing!